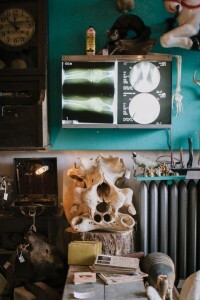 An inventory of the shelves at Woolly Mammoth Antiques and Oddities on Chicago’s North Side sounds like a mad scientist’s shopping list. 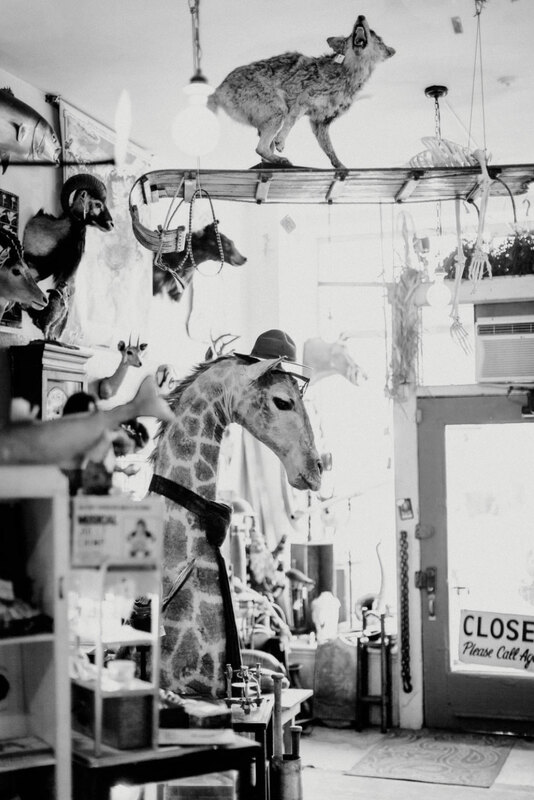 A broken rocking horse, a tray of antique dental tools, a mask shaped like a teddy bear, a human skull under a bell jar, a taxidermic giraffe’s head donning a humongous red necktie: This eclectic store is a go-to spot for everything offbeat and macabre. A hippopotamus skull hangs out under the glow of an X-ray screen. Taxidermic animals hold a special place in the Rusts’ hearts—and store. 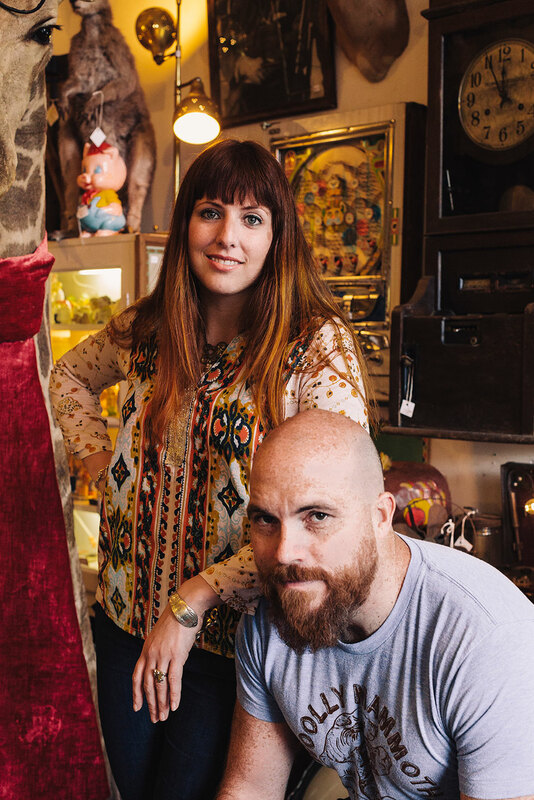 Husband-and-wife store owners Adam (MFA ’05) and Skye Rust (MA ’06) met on an interdisciplinary arts retreat while they were both attending Columbia College Chicago. Skye came into the interdisciplinary arts program focused on photography, but shifted into sculpture and installation art. 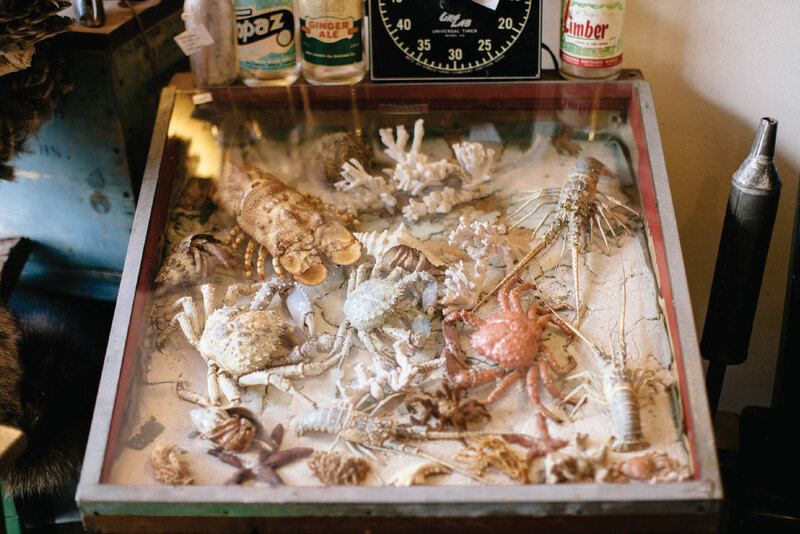 Adam studied in the Center for Book and Paper Arts, where he often incorporated road kill and taxidermy into his installations. They consider the store itself an art installation piece, inspired in part by Columbia’s broad creative approach. Adam turned this old-school gumball machine into a lamp. “We have an arts career right now, but this isn’t something either of us had thought of before,” says Skye. “Our education definitely helped us see that there were other possibilities out there.” Woolly Mammoth’s 2010 origins have a tinge of urban legend. On a trip to Transylvania, Romania, hot on the historic trail of Vlad the Impaler (otherwise known as Dracula), the couple wondered how they could bring that excitement home. “How are we going to make our lives an adventure?” Skye asked. 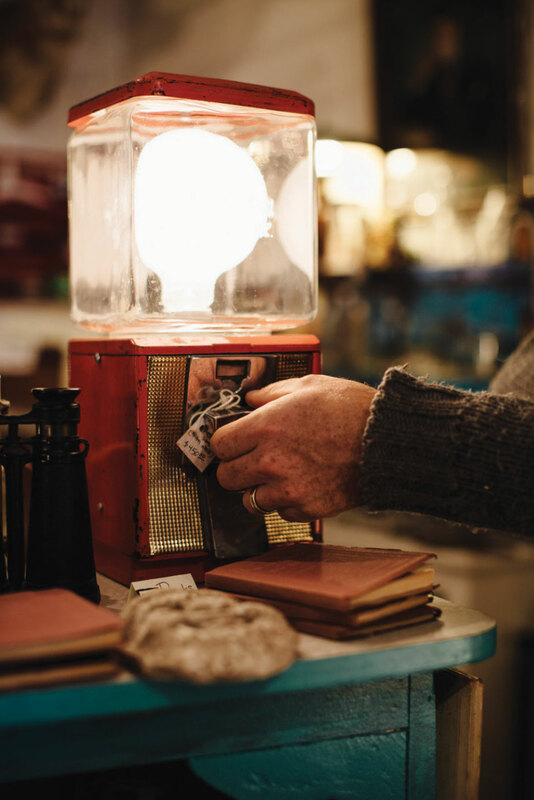 Within a month, they found a storefront in their Andersonville neighborhood and brought Woolly Mammoth to life. Both Adam and Skye grew up in the Midwest (Wisconsin and Indiana, respectively) in antiquing families, and they’d been building their own taxidermy collection for years. Customers might find the taxidermy morbid, but Skye says it’s their way of “saving the animals.” They name each creature that comes through the store—which can make it hard to say goodbye. Adam particularly misses a zebra named Lightning, whom they sold to a bar in Manhattan. In addition to helping Adam buy, sell and run the storefront, Skye works full time in international admissions at Columbia, traveling all over the world to recruit students—and squeeze some Woolly Mammoth shopping into her downtime. She returned from a recent South America trip with a suitcase full of butterflies under glass and shrunken heads (creepy but fake). Adam grew up in a part of Wisconsin where mammoth skeletons were often unearthed, so he feels a certain kinship with the store’s name, as well as the woolly mammoth on the storefront’s neon sign. “It’s an extinct animal that is resurrected from time to time, so we kind of think of it like we’re resurrecting this junk,” Adam says. “We have to dig for it and clean it,” Skye adds.